Want to start a Bullet Journal but don’t think you are artistic enough? Kick-start your new Bullet Journal with these printable planner pages! 12 sizes, designs and colors to pick from! I first heard about bullet journals 3 or 4 years ago. When I saw the beautiful page layouts and the complicated symbol system I was completely overwhelmed. I’m not a very artist person, so I thought that something like that would be completely beyond me. Fast forward a year or 2 and bullet journals seemed to be everywhere! So I gave it a second look and tried to understand why so many people were obsessed with their bullet journals. I decided to start a bullet journal and, well… now I get it! Bullet journaling is fun, easy and calming. It’s easy to focus on designing a beautiful page and forget about what is going on around you. But bullet journals are more than just an artist outlet (especially if you’re like me and not very artist!). They give you a place to organize your life and mind! Then you need to start a BULLET JOURNAL! I’m a lot more focused on my goals and experienced more personal growth since I decided to start a bullet journal. So I’ve mentioned the words “bullet journal” six times already – but what exactly IS a bullet journal? Ready to Start a Bullet Journal? A bullet journal is basically a planner that helps you stay organized and keep up to date on your to-do list. Well, hopefully, you get the idea! Your bullet journal is a single place to keep everything you want to remember or keep track of. In very basic terms, all you need is a notebook and a pen! Exactly WHICH type of notebook and pens you use are going to be up to you and your budget. 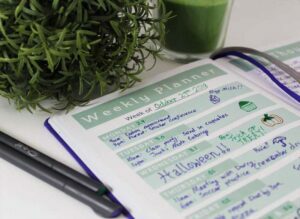 The most popular type of bullet journal notebook is the Leuchtturm series. They do a variety of sizes and colors, but the reason why they are so popular is that their pages are dotted. Instead of lines on the pages, they have a grid of small dots. These dots make it easy to be creative with free-flowing designs, while also having guides to keep everything straight and lined up. These wonderful little Leuchtturm notebooks also have numbered pages and an index page to help you stay organized. I just love the Leuchtturm1917 Hardcover Medium Dotted Journal. The size is perfect for carrying in my purse and the hardcover protects it and stops the corners getting dogeared. Plus, I LOVE the emerald green color! 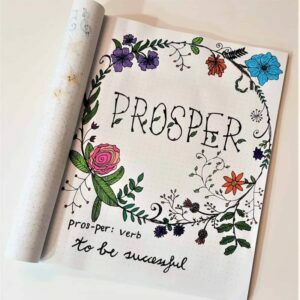 You can use a regular ballpoint pen, but if you want to get creative and add a bit of color and style to your bujo, then you will want some colored pens. Fineline tipped pens are some of the most popular as they come is so many different colors and they won’t bleed through your paper. This Staedtler Triplus Fineliner set of 36 different color pens is great value and perfect for your first bullet journal. The colors are so bright and vibrant, they really make my pages come alive. Also I don’t have problems with the ink bleeding through onto other pages. There are a lot more supplies that you could use, but this post is about how to start a basic bullet journal, so I won’t go into those here. You’ve got a notebook and pens – now you’re ready to get started! Want to start a bullet journal but on a tight budget? Check out my Complete Guide to Cheap Bullet Journal Supplies for thrifty ways to start a bullet journal! The name given to each type of page. You might have a “Monthly Spread” or a “Habit Tracker Layout”. The symbols you use to identify what each entry means. Such as if something is an appointment, an event or a task. The Key is a spread with the break down of what your signifiers, colors or layout mean. Rather than writing everything out in full, symbols and colors are used to speed up the process. A task, appointment or event that has been moved to a different day/week/month. For example, if you didn’t start a report for work on Wednesday, then you “migrate” it to Thursday. An arrow symbol is often used to show this. A log is a place to record events, tasks, appointments etc. It is normally classified in some way. For example “Future Log” – events happening in the future, “Weekly Log” – events happening this week etc. A list of things you want to remember. For example, a list of movies to watch, favorite recipes, places to visit etc. Want to start a Bullet Journal but not sure where to start? Try these printable planner pages for fast and easy Bullet Journal layouts to help get you organized and stay organized! When you start a bullet journal there are a few basic pages or spreads that you want to start with. Once you have those up and running, then you can add more as you expand how you use your bullet journal. This generally goes at the beginning of the notebook. If you have a Leuchtturm notebook then it already has an index page for you (saves time!). As you will have lots of different pages and you will be adding to it constantly, you need a quick way of finding the information that you need. That’s where the index comes in! Firstly you want to make sure all your pages in your entire notebook are numbered (again, the Leuchtturm ones are already numbers – see why they are so awesome?!). Then in your index, you reference the page number and what is on that page. You will also want a Key at the beginning of your journal. As we discussed above, a key breaks down what your signifiers, colors or layout mean. The key is useful when you first start out so you can double check which symbol to use or which color is for which type of item. Red for health-related items, such as fitness classes, doctors appointments etc. I’m not an artistic person so my spreads are much plainer than some, but here’s a photo of my Key page. Most people start their journal with a Future Log spread. This will show the months of the year and give you space to write down events that will be happening each month. Generally, you will only create monthly and weekly spreads at the beginning of each month or week. So you use your Future Log to record items that are happening further in the future. Then when you are ready to create your monthly or weekly spread, you can refer back to it to see what information you need to include. For example, I might put my dentist appointment under September in my Future Log. At the end of August when I create my monthly spread for September, I can refer to my Future Log and see that I need to add the appointment to that day in September. Here’s an example of a beautiful Future Log from Mary J on Instagram. 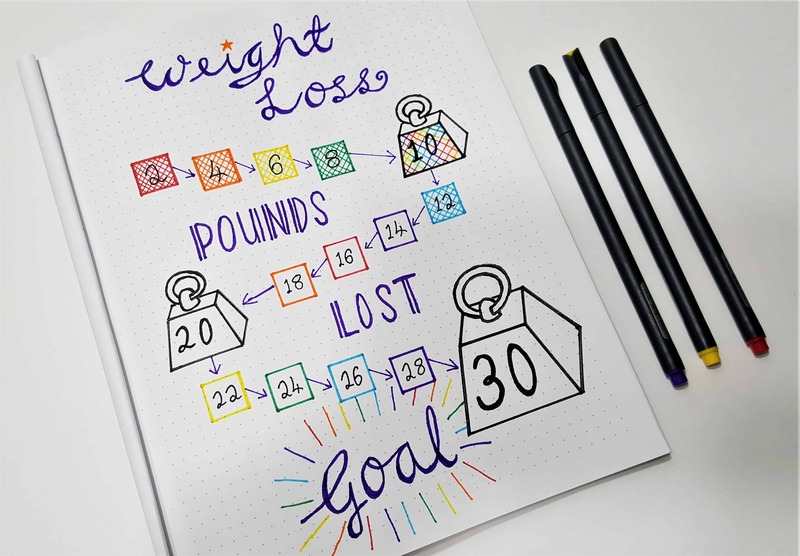 This page is completely optional, but I LOVE goal setting (Check out my tips on strengthening your willpower to help you reach your goals)! You can decide if you want to do one large goal setting layout for the whole year or do smaller ones at the beginning of each month or week. Another great way to set goals is to have a Self Reflection Day. You spend some time reflecting on where you currently are in life and where you want to go! 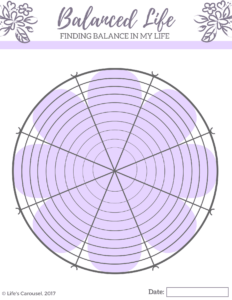 Get a FREE Balanced Life Circle printable to put in your bullet journal to track your progress towards to your goals! The monthly, weekly and daily log pages are the basis of your journal. These are the pages where you will record upcoming events, appointments, and your to-do list. Depending on how you are going to use your bullet journal depends on if you need one, two or all of these types of logs! I don’t have time to sit down every day and create a new daily log, so I just have monthly and weekly logs. If you’re really pushed for time, then maybe you’ll only want a monthly log. Christina at www.christina77star.net has some beautiful examples of weekly spreads. Collections are basically lists of anything you want to remember – recipes, movies, books, places to visit. 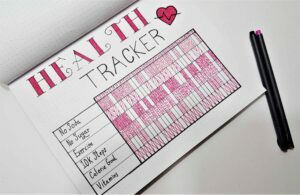 Trackers are used to track habits, behaviors, mood, exercise, workload, diet and more! Here are a couple examples of trackers that I use every day to help me lose weight and stay healthy. There are hundreds of options for these! This is where you can really let your imagination run free! Here are some examples of trackers from some awesome bullet journalers! So there you have it! Everything you need to know to start a bullet journal of your very own. I’d love to know how you get on. Please share in the comments below what you love about bullet journals and some of the fun things you are trying! Index – List of items in the notebook with their page number for quick reference. Key – A break down of what your signifiers, colors or layout mean. Future Log – Yearly overview to record items happening later in the year. Monthly Log – Break down of everything that is happening that month. Can include goals too. Weekly Log – A spread showing the week and what is planned for that week. Daily Log – Shows appointments, events and tasks for the day. Can also record mood, weather, sleep, diet and more. Collections – Lists of things to remember or refer back to. Such as movies to watch, places to visit, favorite recipes etc. Trackers – Used to track habits, mood, exercise, diet and more. Reading Tracker Bullet Journal Ideas - Movies & TV Shows Too! This is a great description of how to start a bullet journal. I’ve been planning on starting my own but i had no clue how to do it. Thanks to your article i now know what to do. Thanks Jasmine. I’m glad you found it useful. Bullet Journals are so much fun. Im not very artistic but I love the combination of organization and creative outlet. Make sure you check back in and tell me how you get on! I love these ideas. The key and the habit tracker will help me a lot. Thank you and God bless you! Hi Sol. I’m so pleased you found them helpful. It really is a great way to keep track of your life… and it’s fun too! There’s not many things in life that are practical and fun! Enjoy! This was very helpful your designs are stunning. I couldn’t believe that you weren’t the artist. I have to work on my calligraphy, but I’m looking forward to starting one as a student in middle school it is hard to keep track of assignments, chorus solo practice, play practice, doctor’s appointments, etc. You explained everything in great deal this was so very helpful I can’t say it enough thanks for adding pictures as well I am a visual learner. Keep up the great work! Hi Ashley. I’m so glad you found this useful. My son is in middle school, and you’re right, there’s a lot to keep track of. Maybe you can have a page (or more than one page) for each subject to keep track of assignments. I’m so impressed that you are looking for ways to get organized already. You have a bright future! Hi Sherri. I’m so happy that you’ve found the guide useful. I am definitely not artistic either! Just have fun and do doodles for yourself! Don’t try to match the artistic ones. It’s your journal, make it your own! I’ve been needing to start a journal to track everything. This is going to help me out a lot getting started. Thank you so much for all the details! I’m glad you’ve found it useful Heather. Having a bullet journal has REALLY helped me to be more productive and organized! I started my bujo in February last year but kind of gave up by April but I restarted in November and it’s been keeping my revision on track and I’m loving how much better it looks now I’ve invested in more pens! That’s great, Kyra. Bujos are a great way to stay organized. I know a lot of students really like them to keep track of the classes, notes, and exams.